Within two feet of the curb. Within 18 inches of the curb. Within one foot of the curb. If stopping at a curb to park, you must be within 18 inches of the curb. Only park where it is safe and legal to do so. 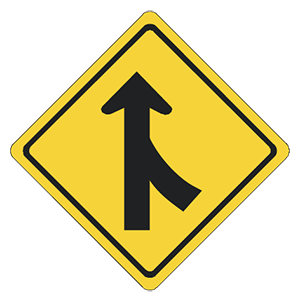 This sign warns that two lanes of traffic going the same direction will soon merge into one lane. What should a driver do when approaching a traffic control signal that is not in operation? Come to a full stop and yield the right-of-way before entering the intersection. If the intersection is clear, the driver does not need to stop. Drive quickly through the intersection to get out of the way of other vehicles. 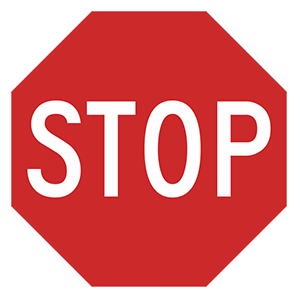 When traffic control signals are not working, a driver must always treat the intersection as an all-way stop and come to a complete stop, unless otherwise directed by law enforcement. The driver must then look and yield the right-of-way before entering the intersection. Watch for vehicles that must stop at all railroad crossings (school buses, trucks carrying hazardous materials, etc.). You must approach all railroad crossings with extreme caution and cross only when you know that no train is coming from either direction. Be aware of vehicles that must stop at all railroad crossings, such as school buses and trucks carrying hazardous materials. Which of the following driving skills are affected by the use of alcohol and/or drugs? Any amount of alcohol acts as a depressant, slowing the function of the nervous system. It will reduce a person's alertness and ability to concentrate, increase their reaction time, and drastically reduce their coordination.